The installation shame on you by Antonis Pittas (Athens, 1973) consists of a graphite drawing on a wooden panel and two display cases. The wooden panel leaning against the wall is completely covered in thin vertical pencil lines. The only light in the room emanates from the display case against the wall, in which neon light has been affixed. At first sight the display case seems to be empty, but there appears to be a small graphite wall drawing in the corner. The second, standing display case also seems to be empty. The installation is apparently simple but together the various elements form a challenging game of the conditions of experiencing displayed objects in a less then ideal environment. 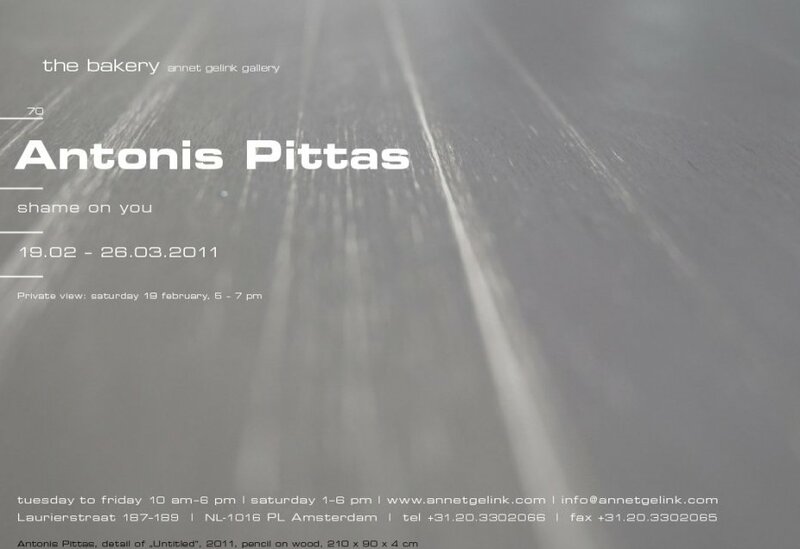 Antonis Pittas studied at the art academy in Athens, at the Piet Zwart Institute in Rotterdam and at the Sandberg Institute in Amsterdam. He had amongst others solo exhibitions in the Van Abbe Museum in Eindhoven (2010), SMART Project Space in Amsterdam (2009) and the Central Museum in Utrecht (2007).